Twenty-four years ago this morning—September 1, 1987—Vietnam veteran Brian Willson joined a handful of peacemakers on the railroad tracks at Concord Naval Weapons Stations to begin what they envisioned as a forty-day fast and vigil to protest arms shipments from this Northern California military base to US-backed forces in Central America. Instead, a 900-ton munitions train, traveling at three times the legal speed limit, plowed into Brian and dragged him under. Standing a few feet away, I saw him turn over and over again like a rag doll and then (as the never-slowing train rumbled on toward a nearby security gate) sprawling in the track bed, a huddled mass of blood. Miraculously, Brian survived (thanks, largely, to the tourniquets applied by his then-wife Holly Rauen, a professional nurse), though both legs were sheared off and his skull was fractured. At a critical turning point in his life, Brian allowed this question in and everything changed. Of course, this question is not Brian’s alone. It is meant for each of us in the midst of the storm of horrific violence that continually bears down on our planet and its inhabitants. Brian’s memoir recounts his journey from childhood in upstate New York (born on the Fourth of July, he enthusiastically shared his family’s pro-military and anti-communist convictions), to his decision to go to law school, and then his being drafted and sent to Vietnam as an Air Force captain, where two incidents changed his life. My first thought was that I was witnessing an egregious, horrendous mistake. The “target” was no more than a small fishing and rice farming community. The “village” was smaller than a baseball playing field. The Mekong Delta region is completely flat, and the modest houses in its hamlets are built on small mounds among rice paddies. As with most settlements, this one was undefended—we saw no anti-aircraft guns, no visible small arms, no defenders of any kind. The pilots who bombed this small hamlet flew low-flying planes, probably the A-37Bs, and were able to get close to the ground without fear of being shot down, thus increasing the accuracy of their strafing and bombing. They certainly would have been able to see the inhabitants, mostly women with children taking care of various farming and domestic chores … The buildings were virtually flattened by explosions or destroyed by fire. I didn’t see any inhabitant on his or her feet. Most were ripped apart from bomb shrapnel and Gatling machine gun wounds, blackened from napalm burns, many not discernible as to gender, and the majority were obviously children. I began sobbing and gagging. I couldn’t fathom what I was seeing, smelling, thinking. I took a few faltering steps to my left, only to find my way blocked by the body of a young woman lying at my feet. She had been clutching three small, partially blackened children when she apparently collapsed. I bent down for a closer look and stared, aghast, at the woman’s open eyes. The children were motionless, blackened blood drying on their bullet and shrapnel-riddled bodies. Napalm had melted much of the woman’s face, including her eyelids, but as I was focused on her face, it seemed to me that her eyes were staring at me. I was startled when Bao, who was several feet to my right, asked why I was crying. I remember struggling to answer. The words that came out astonished me. “She is my family,” I said, or something to that effect. I don’t know where those words came from. I wasn’t thinking rationally. But I felt, in my body, that she and I were one. Bao just smirked, and said something about how satisfied he was with the bombing “success” in killing “communists.” I did not reply. I had nothing to say. From that moment on, nothing would ever be the same for me. Thus began a deep transformation, which led him in the 1980s to notice with deep alarm the connection between what he had experienced in Vietnam and the Reagan administration’s war in Central America. He traveled to the region and saw a vivid parallel between the two conflicts, especially the wanton attack on civilians, and became convinced that he had to take action. “We are not worth more, they are not worth less,” he declared, and joined the Veterans Fast for Life on the steps of the US Capitol in 1986, where he and three other former members of the US military fasted for 47 days. One year later, he and others formed Nuremberg Actions—named after the principles of international law enunciated in the wake of the Nuremberg tribunal following World War II that defined crimes against humanity and the responsibility and complicity in such crimes—and organized a 40-day fast at Concord in which he and others planned to block weapons trains. A Freedom of Information Act request had yielded concrete evidence that ships leaving this base were carrying 500-pound bombs, white phosphorus, and millions of rounds of ammunition, and Brian wanted to stop such shipments in their tracks. He expected the train to stop, at which point he would be removed and arrested—in effect compelling the military to demonstrate the kind of care that should also be accorded to those at the other end of the line in Nicaragua and El Salvador. Instead, the government ran the train (in spite of the clear communication with the Navy over the prior ten days), thus dramatizing with palpable clarity what those at the end of the line faced every day. What can we learn, after all these years, from Brian’s journey? One lesson is the importance of “finding your own tracks and taking a stand there,” as he has often said. A catchphrase we used at the time held that “Stopping the war starts here”—stopping it at a weapons base, but also in many, many other places. Brian did so by taking this action “in person”: using the most powerful symbol at his disposal, his vulnerable, resilient, determined, and spirited body. We can do this, too. This is not to say that we are all called to sit on train tracks (such action requires much discernment and training). But there are many places to stand nonviolently, withdrawing our consent and pointing our communities, our societies, and even ourselves in a new direction. The world begins to change when we find this place. Thank you so much for this, Ken. Willson’s book seems like a great gift to us and our all-too-short memories of sacrifice like his. Having spent some time with some guys from Veterans for Peace recently, I’ve been hearing a lot from them about the impact of Willson’s speech at the VFP convention in Portland this year—it sounds like it was the major highlight of the meeting, hands down. The whole thing can be seen or downloaded at Archive.org. There’s also a highlight with a montage on YouTube here. Thanks Ken for this powerful peace about a tragic assault by the US government on a peaceful Vietnam Veteran and nonviolent protest at Concord Naval Weapons Station. I highly commend Brian’s book to everyone who wants to move toward a world where “We are not worth more than the lives of everyone else in the world and they are not worth less than our lives.” We are all truly brothers and sisters. I purchased this book at the L.A. Anarchist Bookfair back in late June (2011), and from the moment I opened it and began to reading its preface, I couldn’t put the book down. In early September (2011), while Brian Willson was on tour in southern California, I went to see him speak three times. Although Blood on the Tracks is labeled a “memoire” (and it is), because of the broad range of activities in which Willson has been engaged throughout his life, it is far more than a simple biography. As the subtitle states: “The Life and TIMES of S. Brian Willson”. 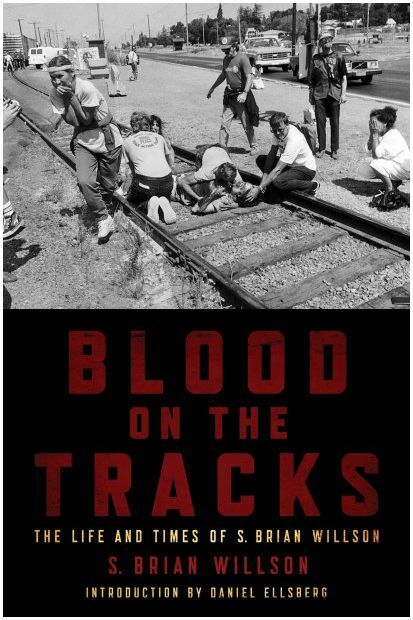 Blood on the Tracks is not only a retelling of his compelling life story, but an indictment of the violence endemic to American society at all levels. From his idyllic upbringing in rural, conservative New York state, to the Mekong Delta, his soujourn working in America’s prisons, and his involvement in 1980s Central America struggling against Ronald Reagan’s terrorist organizations, Willson bears witness to the horrors of American civilization at the end of the twentieth century, weaving into his narrative themes such as civil rights, American culture, American foreign policy, and the broad history of humanity. He teaches us not only the history of Viet Nam and its defense against foreign invaders (the French; the Americans), but contemporary Colombia, Central America, Cuba, Haiti (where Willson, along with fellow members of a veteran’s peace group, met with the democratically-elected Jean-Bertrand Aristide just months before his US-backed ouster), Iraq, Palestine, and more. If Willson’s activism consisted of nothing more than speaking and acting out against the brutality of the Viet Nam war while on active duty IN Viet Nam, it would be worth reading. But, after returning to the States, in Louisiana, Willson worked in civil rights, later worked in the American prison system (referred to as the American ‘criminal INjustice system’ in the book), founded and directed a Vietnam Vet’s center, and, in the 1980s, visited Central America during the time Ronald Ragean was funding terrorism in Nicaragua and El Salvador, and genocide in Guatemala. Then, most famously, in 1987, at a protest against the shipment of arms to Central America for use by Ronald Reagan’s terrorists, Willson lost his lower legs when the U.S. Navy tried to murder him. For this he is remembered and beloved by the people of Central America. Willson’s writing is conversational and engaging; his subject matter far-ranging and encyclopedic. This book is far more than the story of a Viet Nam War veteran turned peace activist; it’s the story of a brave human being who has stood up for human dignity and almost paid with his life for having done so. There’s much more to this book than can be contained in a single review. Read it and weep for humanity. I did.